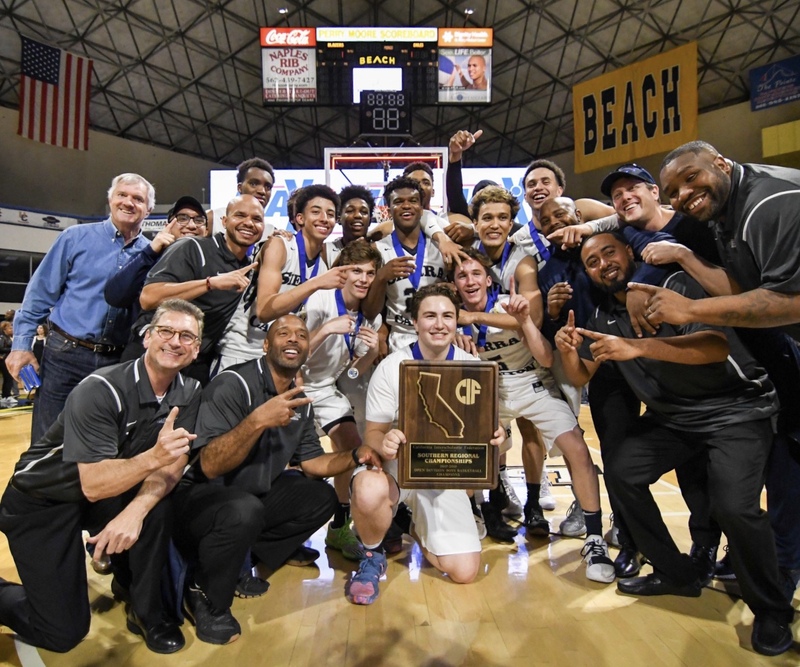 The 2018 CIF Southern California Regional Championships were highlighted with two key matchups in the bracket’s top division: Sierra Canyon vs. Etiwanda & Windward vs. Clovis West. Windward, the defending Division One state champions, clashed with last year’s Open Division champions, Clovis West, and beat the Golden Eagles wire-to-wire by a final score of 61-50. Star junior guard Charisma Osborne went down with cramps late in the third quarter for Windward, but returned in the fourth to finish off an inspiring performance. Osborne scored 22 points, snagged nine rebounds and snatched four steals en route to victory. “I really wanted this win, and just told myself all I need is eight more minutes,” Osborne said. “I focused on defense and pressured the ball as best I could.” Sela Kay contributed her usual barrage of three-pointers, shooting 66 percent from distance, and Kamil English posted 12 points. The Wildcats committed 10 fewer turnovers than Clovis West and out-scored them by 13 points in the third quarter. Clovis West, winners of 60 straight Tri-River league games, beat the likes of Mater Dei and Harvard Westlake on the road to the Regional finals. Head coach Craig Campbell lost over five players from last season’s state championship squad, and fell just short of seizing another regional title. “This has been a remarkable year, ” he said. Madison Campbell, a five-foot-elleven junior guard, led Clovis West with 18 points. Aari’yanna Sanders, also a junior, scored 15 points and secured eight rebounds. Scotty Pippen Jr. stepped to the line with 25 seconds left in the Regional finals, Sierra Canyon leading by four. He nailed both free throws, but K.J. Martin fouled out on the other end on a Kessler Edwards three-point attempt. Edwards hit all three free throws to pull Etiwanda within three, 55-52. Pippen Jr. drew another foul in the double bonus, and missed the first but made the second. Down four, Krystian Wilson stepped into a huge three for Etiwanda and drained it. Five seconds remained, and Duane Washington Jr. was fouled in the front court. Washington Jr. didn’t let the pressure get to him, netting both shots to give Sierra Canyon a one-point cushion. Etiwanda struggled to get a good look off and missed as time expired, giving Sierra Canyon a 58-55 Regional championship victory. Midway through the second quarter, Cassius Stanley flew out on the break and blasted to the rim, laying the ball in over the Etiwanda defense. While in the air, Stanley collided with a defender and tumbled over head first. The arena was in shock, as the five-star recruit stayed on the floor for minutes. He was helped off the floor by multiple physical trainers, and would not return. “We all came together after that play and said, ‘let’s do this for Cassius,'” Martin said. “I didn’t see the fall, but defiantly he took a hard hit.” Sierra Canyon rallied for the rest of the second quarter after trailing by as many as seven, Etiwanda taking a 24-20 lead into the half. Stanley would return to the Sierra Canyon bench in the second half. Pippen Jr. exploded for 20 second half points, finishing with 22 on 14 shots. Martin put up 11 points and Washington Jr., an Ohio State commit, poured in 18 with seven rebounds. Edwards was dominant for Etiwanda, dropping 25 points with 12 rebounds. Sierra Canyon advances to face Sheldon in the state championship, March 24 at the Golden 1 Center in Sacramento.